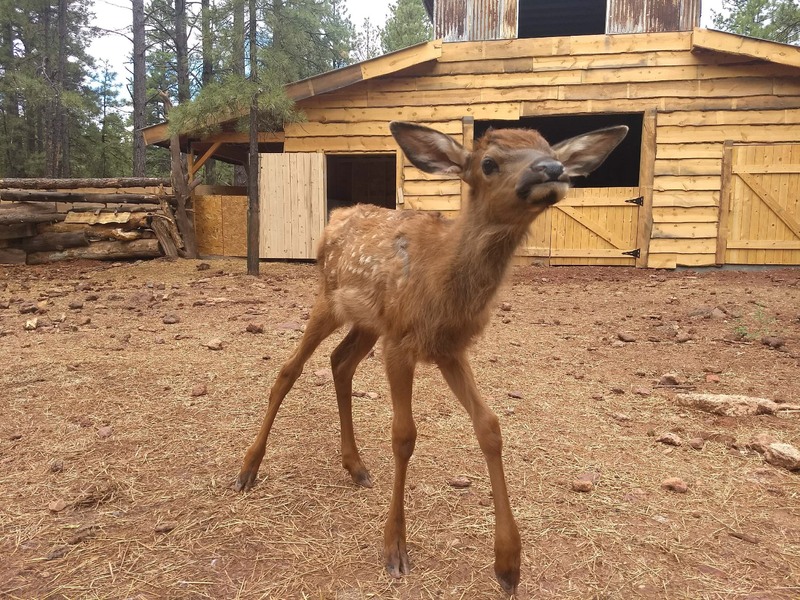 Lucky, the one-month-old elk calf rescued by Bearizona after her mother was hit by a vehicle on I-40, is almost fully recovered from a dramatic entry into the world and is on display in her new home. It really is a miracle Lucky made it, which is why the family that helped save her requested we give her that name. An elk calf, appropriately named Lucky, was rescued by Bearizona after her pregnant mother was hit by a vehicle on I-40 June 10. A month later, the one-month-old calf is almost fully recovered from a dramatic entry into the world and is on display in her new home at the wildlife park near the Grand Canyon. Lucky is the twelfth wild animal rescued this year by the popular drive- and walk-through park devoted to providing homes to wild animals in need. 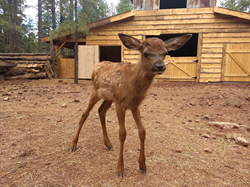 Lucky’s late mom was pregnant with her at the time of the accident, and the newborn elk calf was brought into the world and saved by Flagstaff firefighters and a Prescott family who stopped at the scene and then rushed the calf to Bearizona in their motor home. She is now healthy enough to be on display along with a recently rescued two-month-old pronghorn fawn. Jessie, the pronghorn fawn, was displaced and then unable to be safely reunited with her family by the Arizona Game and Fish Department. The public can see the two together in their new home at Bearizona beginning this week. For more information, visit http://www.bearizona.com. Bearizona is a drive- and walk-through wildlife park south of the Grand Canyon in Williams, AZ, near the intersection of Historic Route 66, Interstate 40 and Highway 64. The park’s mission is to rescue wild animals in need of new homes and promote conservation by fostering memorable and educational encounters with North American wildlife in natural environments. Bearizona invites guests to take a scenic, three-mile drive through packs and herds of wild animals followed by a leisurely stroll through Fort Bearizona, where additional animals can be seen beneath the towering ponderosa pines of Coconino National Forest. “It really is a miracle Lucky made it, which is why the family that helped save her requested we give her that name,” said Bearizona Owner Sean Casey.